Looking for a fresh new burger experience? Why not try our Lamb Burger Pita Sandwiches? 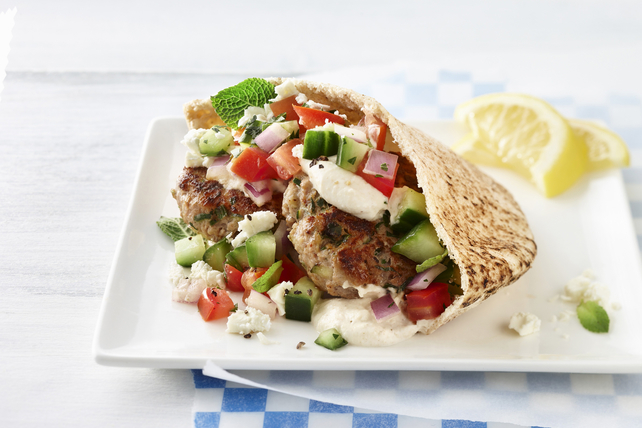 These yummy ground lamb burgers are topped with feta, tomatoes, cucumbers, red onions and mint, then drizzled with a creamy cucumber dressing nestled in pita bread. These tasty sandwiches make the perfect addition to any lunch or dinner. Mix meat, bread crumbs, garlic and egg just until blended; shape into 8 (1/2-inch-thick) patties. Meanwhile, combine cucumbers, tomatoes, onions and mint. Fill each pita pocket with 2 burgers; drizzle with dressing. Top with cheese and cucumber mixture. For a change of pace, heat the pita breads before filling as directed. Wrap the cut pita breads in foil, then grill along with the burgers 10 min. or just until warmed. Open foil packet carefully before filling as directed. Prepare using lean ground beef.